Roy Hodgson’s England have been placed in the toughest of sections for this summer’s World Cup in Brazil but if they can progress from the so-called Group of Death, their chances of progressing to the final should be much improved. You can back Hodgson’s men at 28/1 with Bet365 to win the tournament outright but can England possibly add to their one tournament victory which took place almost fifty years ago? England were hosts for the 1966 tournament but Alf Ramsey’s side were among the outsiders behind a strong Brazilian unit who had won in 1958 and 1962. Germany and Portugal were also strongly fancied and the home nation were among the outside bets having been knocked out in the quarter finals four years earlier. England’s campaign got off to a subdued start with a dour, 0-0 draw against Uruguay and Ramsey was forced into making some team changes ahead of the next tie. Matters improved with back to back 2-0 victories over Mexico and France with Liverpool’s Roger Hunt scoring three of the five goals. As a result, the hosts progressed to the next round as group leaders and the manager would have been particularly pleased with the three clean sheets kept by keeper Gordon Banks. The quarter finals saw England engaged in a bad tempered match against Argentina which was eventually won by a solitary goal from Geoff Hurst who had been brought into the side to replace the injured Jimmy Greaves. The game was marred by indiscipline and the sending off of Argentina’s captain Antonio Rattin. England progressed to meet Portugal in the semi finals who fielded the prolific Eusebio in their line up. The striker would go on to finish as the tournament’s leading scorer but it was Bobby Charlton who stole the headlines with a brace as England finished 2-0 winners. West Germany waited in what was to become one of the most dramatic finals in World Cup history. The Germans took the lead with a Helmut Haller goal after 12 minutes but England were level soon after through Hurst. West Ham’s Martin Peters gave the home side the advantage and when it looked as if England were cruising to a 2-1 victory in normal time, Wolfgang Weber equalised with just a minute left on the clock. Controversy reigned in the first period of extra time as Hurst’s shot hit the underside of the crossbar and although the Germans claimed that it had bounced on the line, referee Gottfried Dienst awarded the goal after consultation with his linesman Tofik Bakhramov. The disputed goal is still talked about to this day in a game that was sealed by Hurst’s third goal in the dying seconds. England had triumphed by four goals to two and as the World Cup heads to Brazil in 2014, the nation is still waiting for a follow up win. Like many nations in World Football, England declined to enter the early tournaments from 1930 onwards and only chose to take part in the 1950 competition. Having made it past the qualifying phase, Walter Winterbottom’s side arrived in Brazil but the finals were to end in embarrassment for a strong squad. Things started positively enough with a 2-0 victory over Chile but England were humiliated in a 1-0 defeat to the part timers from the United States. Qualification to the next round remained possible but Spain inflicted a second straight 1-0 loss and went through at England’s expense. Things were more positive four years later as England topped their group when the tournament headed to Switzerland. The campaign opened with an entertaining 4-4 draw against the Belgians before the Swiss were defeated by goals from Jimmy Mullen and Dennis Wilshaw. However, a bright opening came to an end at the hands of a strong Uruguayan team who defeated England in the quarter finals by four goals to two. 1958 saw the tournament head to Sweden but England were disappointing once again as they failed to progress beyond the group phase. They may have been undefeated but three draws to the Soviet Union, Brazil and Austria weren’t enough to progress. 1962 saw England in the quarter finals once again but by the time they hosted the 1966 tournament, there was little in the way of history to suggest that they would go on to win in. Mexico hosted the 1970 World Cup and Brazil were among the hot favourites in familiar South American conditions. As reigning champions however, England were confident of upsetting the odds and delivering back to back wins. That confidence seemed to be justified in the opening exchanges as Alf Ramsey’s men beat a resolute Romania thanks to a solitary Geoff Hurst goal. England succumbed to a defeat to Brazil in their next tie but were more than a match for their opponents in a game that is remembered for some brilliant defending by Bobby Moore and a breath taking save from Pele by Gordon Banks. 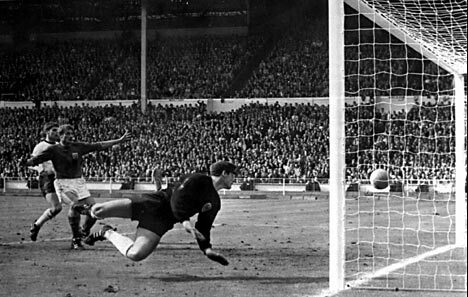 A 1-0 win over Czechoslovakia sealed England’s passage to the next round where West Germany were waiting to exact revenge for their 1966 Final defeat. England’s preparations were hit as Gordon Banks fell ill on the eve of the game but things looked comfortable after 50 minutes as the defending Champions took a 2-0 lead through Alan Mullery and Martin Peters. Ramsey then made some much criticised substitutions and after the Germans had levelled through Franz Beckenbauer and Uwe Seeler, a Gerd Muller goal in injury time put England out. Alf Ramsey remained in charge but after his side failed to qualify for the 1974 finals in West Germany, he was replaced by Don Revie. Unfortunately, although Revie was very successful at club level with Leeds United, he couldn’t translate that success onto the international stage and he deserted England for a controversial move to the UAE in 1977. England failed to qualify for Argentina in 1978 in a barren period for English football. Along with the many changes of manager, great players such as Bobby Moore, Martin Peters and Geoff Hurst had retired and there was a lack of quality coming through to replace them. It was amidst some relief that Ron Greenwood led his England side to Spain in 1982 as England made it through a qualifying phase for the first time since 1962. It had been a successful campaign and the tournament got off to the best possible start as Bryan Robson scored inside a minute before England went on to beat the French by three goals to one. A 2-0 win over the Czechs followed and although the nation expected a bigger win over Kuwait, the 1-0 scoreline was enough to see them progress at the head of Group 4. The 1982 tournament required teams to play in a second group phase and although England remained unbeaten over their two matches, successive draws against West Germany and Spain were not enough to progress to the knockouts. England were back four years later at Mexico 1986 under the stewardship of Bobby Robson and just made it through to the knockout phase with a Gary Lineker hat trick against Poland. Robson’s men had started badly against Portugal and Morocco but Lineker’s goals seemed to have galvanised England who went on to beat Paraguay 3-0 in the first knockout phase. That all meant a tough quarter final against Argentina and a game which ended in controversy after Maradona’s controversial ‘Hand of God’ goal. The South Americans deserved to win the game but 28 years later everyone remembers the blatant handball which led to the first goal in a 2-1 victory. When Bobby Robson took England to the World Cup in Italy in 1990, he has already agreed to leave his post as national manager and take up a position with Dutch giants PSV Eindhoven. That move led to calls for his sacking but fans were relieved to see him stay as he took the nation to the semi finals for the first time since 1966. England’s campaign started with a 1-1 draw against the Republic of Ireland before a 0-0 result against the Dutch left the side needing a win in their final group match against Egypt. Centre half Mark Wright provided the only goal of the tie and although England topped their section, their campaign up to this point hadn’t been a convincing one. Robson’s men were subsequently taken to extra time by Belgium and with the match set to head to a dreaded penalty shoot out, a dramatic late goal from David Platt sealed the 1-0 win. That earned England a quarter final match with Cameroon and after the African side had beaten reigning Champions Argentina on the opening day of the tournament, this was never going to be easy. Cameroon were in front late on and on course for another upset but with seven minutes left on the clock, a Gary Lineker penalty levelled the scores at 2-2. Lineker was precise from the spot once again in extra time as England came through a nervous encounter. Old rivals West Germany waited in the semis and it was to be a game of heartbreak for Robson and his men. The tie was level at 1-1 after extra time but the Germans progressed after a dramatic penalty shoot out. 1994 saw England miss out on qualification but they were back in 1998 under Glenn Hoddle. The side made the round of 16 but in another infamous tie, David Beckham’s sending off was the turning point as England lost on penalties to old rivals Argentina. England sides have qualified for every World Cup tournament since 1998 but have never really looked like adding to their one success back in 1966. The 2002 finals were jointly held in South Korea and Japan and Sven Goran-Eriksson’s men managed to get their revenge against Argentina when a David Beckham spot kick sealed a 1-0 victory, thereby eliminating their rivals. Denmark should have provided a stiff test in the round of 16 but England cruised the game with three goals inside the first half. That 3-0 win brought Eriksson’s men up against eventual winners Brazil and hopes were high after Michael Owen put the side up on 23 minutes. Rivaldo equalised in first half injury time but in a moment of comedy, Ronaldinho’s long free kick caught David Seaman off his line and the goal was enough to put England out of the competition. The 2006 tournament in Germany saw a very positive group campaign as England topped their opening section with two wins and a draw. Victories over Paraguay and Trinidad and Tobago gave confidence to the team for the knockouts and that confidence grew when a David Beckham strike saw England overcome Ecuador and progress beyond the round of 16. Once again however, an England side was to bow out of the competition at the end of a penalty shoot out. Having been reduced to 10 men following Wayne Rooney’s sending off, the English matched Portugal in a 0-0 draw but lost their composure from the 12 yard spot as the Portuguese won the shoot out by a comfortable 3-1 margin. 2010 in South Africa was a largely forgettable tournament as England barely deserved to get out of their opening group. A disappointing 1-1 draw with USA was followed by a dismal, goalless encounter with unfancied Algeria. The narrowest of 1-0 wins against Slovenia was enough to take Fabio Capello’s side to the round of 16 where they were taken apart by Germany. At 2-1 down, England were rightly aggrieved when Frank Lampard’s shot was adjudged not to have crossed the line but in reality, the Germans were the better side by far and fully deserved their 4-1 victory. Recent tournaments have seen England progress from their group and into the knockouts. Can they do the same again in Brazil or will Italy and Uruguay ensure an early exit in 2014?